A beautiful novel of father hunger, tenderly written and carefully plotted…A remarkable, memorable first novel. Marisa Silver is an explosive writer, capable of igniting prose with m moments of startling insight…Silver delivers her most subtle thoughts and mature wisdom…in lines that possess the compact power of poetry. This is an excellent book. Reading it, I was reminded of the kind of fierce lump-in-the-throat emotions a book can stir. Marisa Silver has a preternatural insight into the hearts and minds of children, and her writing is passionate, wise, fearless, and often utterly gorgeous. Silver deftly tells the stories of three families whose struggles to survive are made tougher by depression, dementia, and traumatic separation…A perceptive look at the rippling effects of adversity on family dynamics. A luminous piece of fiction. I love the way it takes the form of the family novel and raises the stakes its people face out into the jagged perils of the real world. And all this is narrative with great intimacy and tenderness – a rare, striking, unsentimental book. Silver proves herself a deft juggler of plot lines and an effective realist; she conjures an aching world of half-truths, physical need and emotional frustration…This is a moving novel, each of its well-wrought characters finding some comfort in the ‘solace of in-between spaces. In No Direction Home, the sense of longing is s alive and so pervasive, yet, at the same time, it is so individual t each of Marisa Silver’s haunting characters. This is a rich, textured novel about the depth and resilience of imperfect love. It is ambitious, accomplished, and tremendously moving. Silver is masterful at orchestrating her complicated cast of characters and settings…But perhaps the most impressive quality of this novel is her ability to create distinct and idiosyncratic characters struggling with physical, psychological and economic limitations…Silver is refreshingly unafraid of emotion as she holds the strands of her narrative taut and brings each of the intersecting dramas in this knowing first novel to a moving and resonant conclusion. 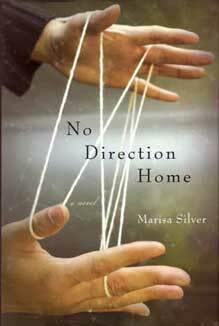 Marisa Silver’s first novel, No Direction Home, presents a promising sampler of miseries…juggling so many plot lines without confusing the reader is a considerable feat, and Silver manages it well.